France, or French Republic, is a country in Europe having a couple of the overseas territories, such as: French Polynesia, Saint Bathelemy, Saint Martin, Saint Pierre and Miquelon, as well as Futuna and Wallis. There is also one collectivity – New Caledonia, one more overseas territory – French Southern and Antarctic Lands and one island possession in the Pacific Ocean, which is Clipperton Island. To be exact about where all of these territories are, we can mention, that French Guiana is in South America, both Saint Pierre and Miquelon are in the Atlantic Ocean, while Guadeloupe, Martinique, Saint Martin and Bathelemy are in the Antilles. To continue this list: French Polynesia, New Caledonia, Wallis and Futuna, as well as Clipperton Island are, as it was mentioned before, in the Pacific Ocean. Reunion Island, Scattered Islands, Crozet Islands, Saint Paul, Mayotte and Amsterdam islands are in the Indian Ocean. Kerguelen Islands are in the Indian Ocean and Adelie Land is in the Antarctic one. The term of “French Republic” includes all of the overseas French collectivities and territories, but it is not a part of the European Union. France extends from the Mediterranean Sea to the English Channel up to the North Sea, from the Rhine and all the way to the Atlantic Ocean. French Guiana is also one of the French territories and it includes the parts on the South American Continent and other island territories in the oceans – Pacific, Atlantic and Indian. The territory of France is over 643000 square kilometres and if to be precise it exceeds 643800 square kilometres. The total population of France is almost 67 million people as it was noticed at the beginning of this year. France if a republic (unitary semi-presidential one) and its capital is Paris. Paris also is the largest city alongside being the main commercial and cultural city. The other big cities of France are Lyon, Marseille, Lille, Nice, Toulouse and Bordeaux. France is a global centre of philosophy, art, science, and it includes many World Heritage Sites, protected by UNESCO. There are over 83 million foreign tourists visiting France each year and this amount of tourists is the largest in the world. 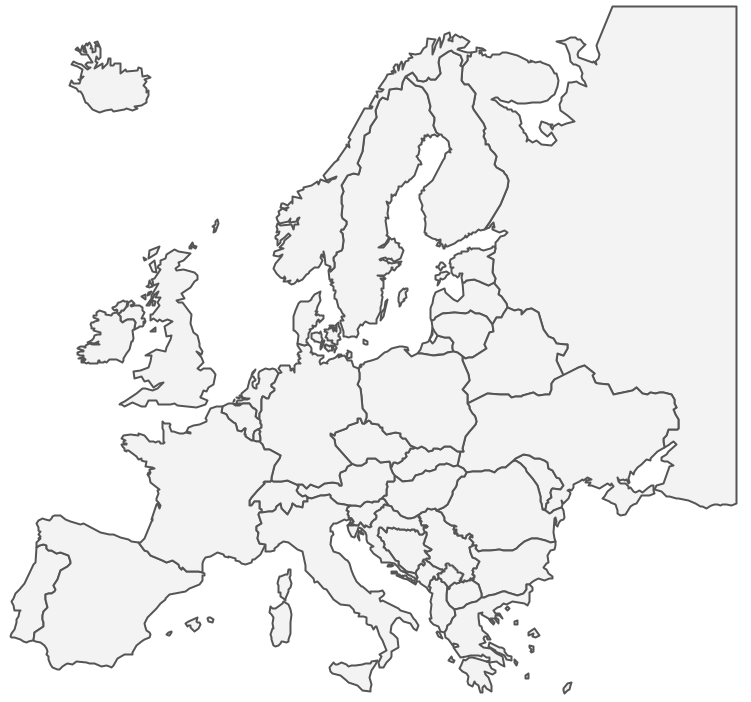 The part of France in Europe is known as “Metropolitan France”. To be exact, it is situated in the Western part of Europe. The borders of France are in the north by the North Sea, in the northwest by the so-called “English Channel”, in the west by the Atlantic Ocean and in southeast by the Mediterranean Sea as well as Atlantic Ocean. 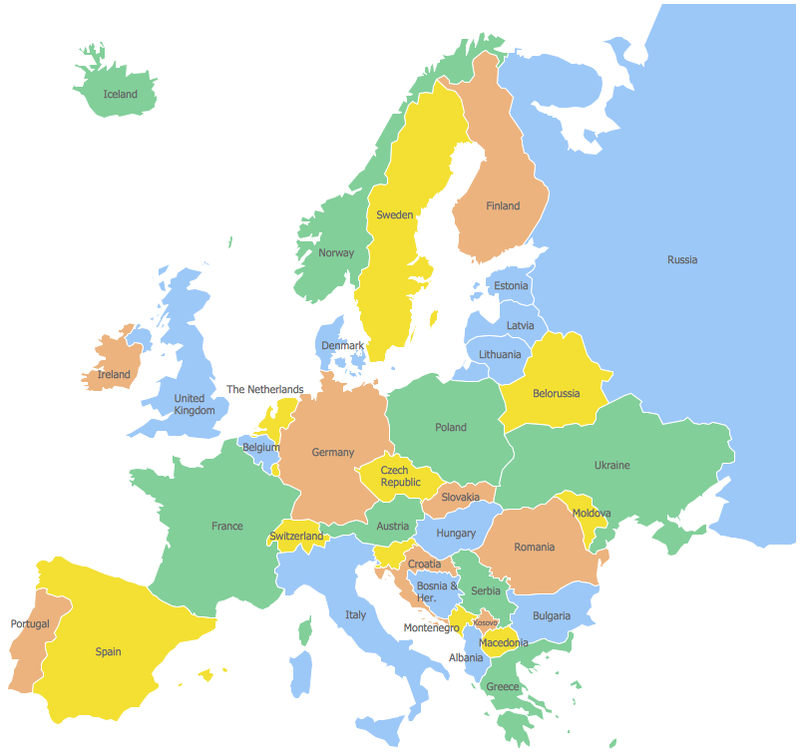 France “neighbours” are Luxembourg and Belgium, which are the countries in the north-east from France, the countries in the east are Switzerland and Germany, the countries in the southeast – Monaco and Italy, and in the south and southwest – Andorra and Spain. There are mountains in the southern and in the eastern part of France, which are the Alps, the Pyrenees and the Jura. There is also a river called “Rhine” on the border of the eastern part of France. In general the French continental part covers about 1000 km from east to west and from north to south. The total territory of France in Europe exceeds 551000 square kilometres (as they say, it extends up to 551500 square kilometres nowadays). 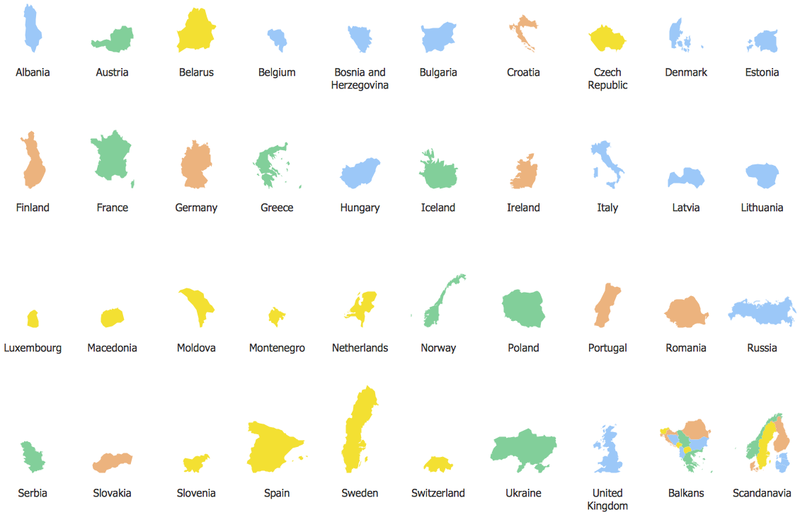 This country is the largest to compare it to the other countries in the European Union. The total land area of France, including its overseas territories and departments (besides the Adelie Land) is over 643801 square kilometres, which is 0,45% of the total land area on the planet Earth. Going to France you can notice a huge variety of different landscapes, from the mountain ranges of the Alps in the south-east, the coastal plains in the west and in the north of this country, Pyrenees in the southwest and the Massif Central in the south central part of France. France is also the second-largest “Exclusive economic zone” in the world. The highest point in the western part of Europe is the top of the mountain – Mont Blanc. This mountain is situated in the Alps on the Italian and French border. There are also very many different rivers in France, such as: the Rhone, mentioned above and which divides the Alps from the Massif Central, the Seine, which goes through Paris, the Garonne and the Loire. There are 13 regions in metropolitan France and 5 overseas. Each of the regions is divided into 101 departments. Among these 101 departments, five of them - Guadeloupe, Martinique, Mayotte, Reunion and Guiana - are in the overseas regions, which are also overseas departments. All 101 departments are also subdivided into 335 so called “arrondissements”, and these “arrondissements” are also subdivided into 2054 cantons. All of the cantons are divided into 36658 communes and three of such communes, which are Marseille, Paris and Lyon, are subdivided into 45 so called “municipal arrondissements”. The communes, the departments and the regions in general are all known as “territorial collectivities” as they possess both local assemblies and executive. Cantons and arrondissements are administrative divisions, but until 1940, the arrondissements were territorial collectivities (with an elected assembly). 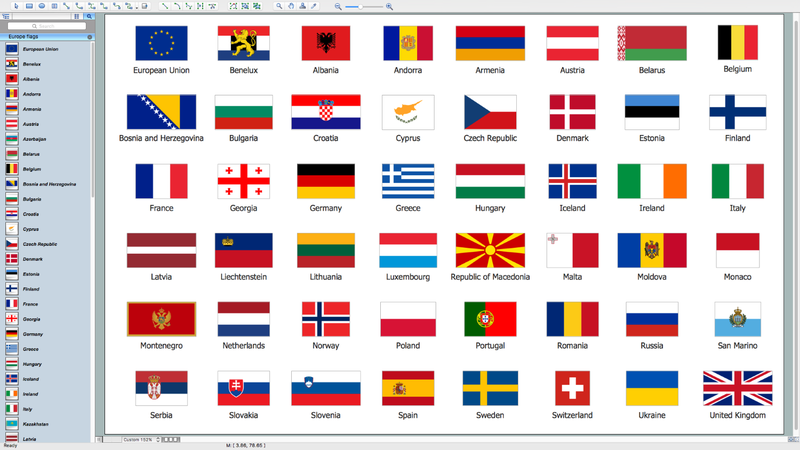 If you want to create a map of France in Europe as a part of the European Union, Schengen zone and other French territories, then you can also use ConceptDraw Pro as this software allows to create such maps with the simplicity of move. If you download ConceptDraw DIAGRAM application and then the one called “ConceptDraw STORE”, then we can guarantee, that you can find the needed solution, which can be very useful for you in your task. 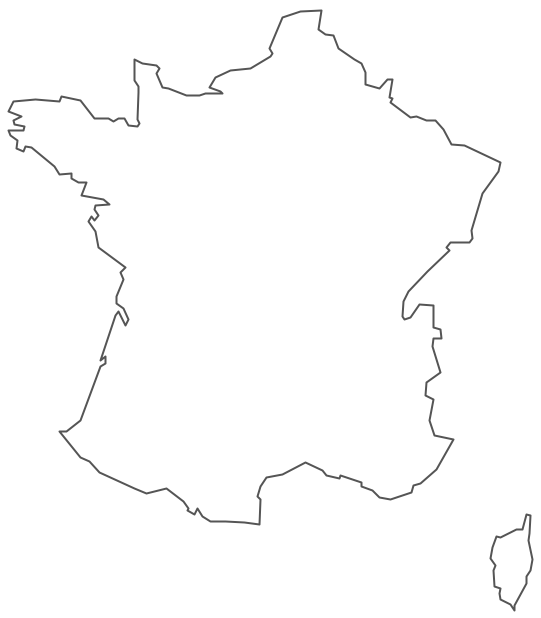 Thus, the Continent Maps solution, which also can be found and downloaded from the “Maps” area of “ConceptDraw Solution Park” on this site, can be very useful in terms of using its libraries, for example, the one vector stencils library, called “France” for making great looking maps, including the drawings of the contours of France and its overseas territories. This particular library contains all of the needed contours for using them in your drawings of the maps of France itself and its other territories, or its parts separately while working in ConceptDraw DIAGRAM diagramming and vector drawing software. 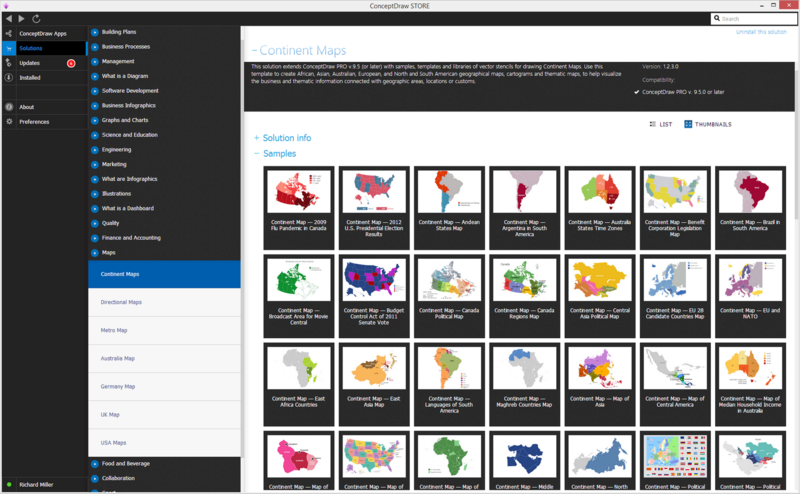 Use the France library to draw thematic maps, geospatial infographics and vector illustrations for your business documents, presentations and websites. 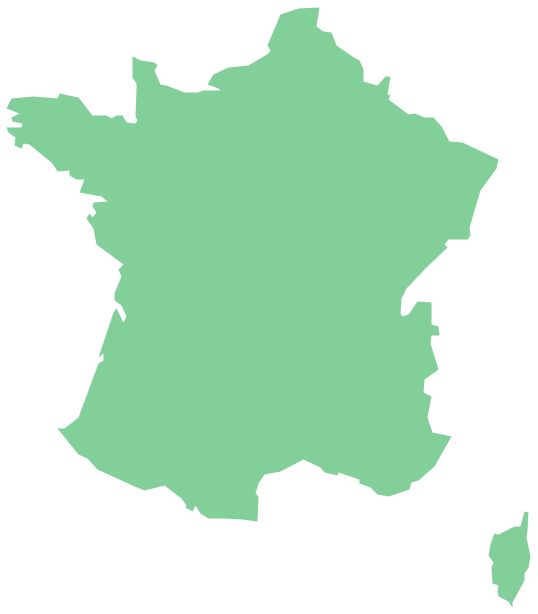 France spans 643,801 square kilometres (248,573 sq mi) and has a total population of 66.6 million.